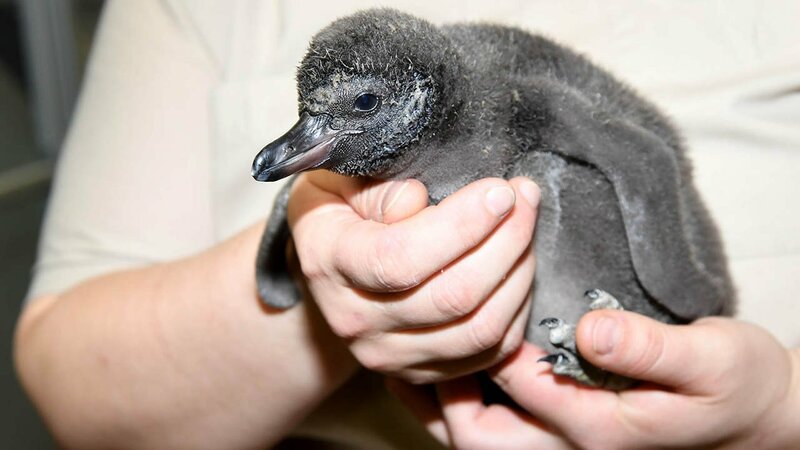 Brookfield, Ill. (WLS) -- On Wednesday the Brookfield Zoo announced the arrival of a new Humboldt Penguin chick. The male chick hatched Feb. 12 and is being handreared by the zoo's staff. He does not yet have a name. The zoo said in a statement that the chick is "thriving." He's eating a healthy diet of herring and marine smelts and is weighed three times per day. A Humboldt Penguin chick hatched at Brookfield Zoo. The chick's next major milestone comes at two months, when he'll molt down from his down feathers and will be introduced to a shallow pool of water. Officials said that as early as May, depending on the chick's willingness to participate, he may become an animal ambassador in the zoo's Penguin Encounters program, which allows visitors to interact with the penguins and learn more about the species and the zoo's efforts to preserve them in the wild. Humboldt Penguins are native to the Pacific coast of South America and are considered a threatened species by the U.S. Fish and Wildlife Service. The zoo's newest addition, a Humboldt Penguin chick.